My aquarium basement. All the space is used. 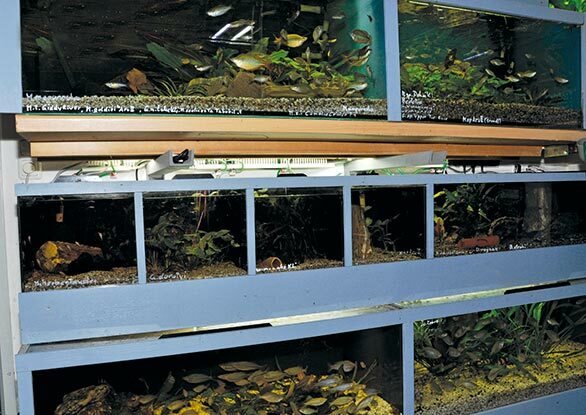 I have placed aquariums and created niches for the external filters in every nook possible. 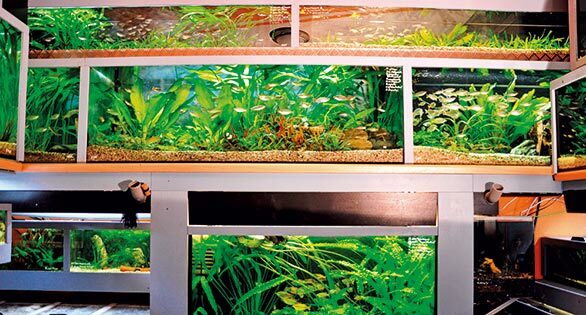 How do you establish an aquarium basement, if you really only wanted a beautiful living room aquarium? In my case, a defective solenoid valve was the trigger. In 1999, we started our home construction. Of course, an aquarium was also included in the plans. “The bigger, the easier it is to maintain,” was how I argued for it with my wife. And so it came to pass that a 1,400-L (360-gal) aquarium with the dimensions 200x100x70 cm (80 x 40 x 28 in) was included in the blueprint. We wanted it in the living room, where it would look like a picture, while an adjacent room would serve as engineering and maintenance space. 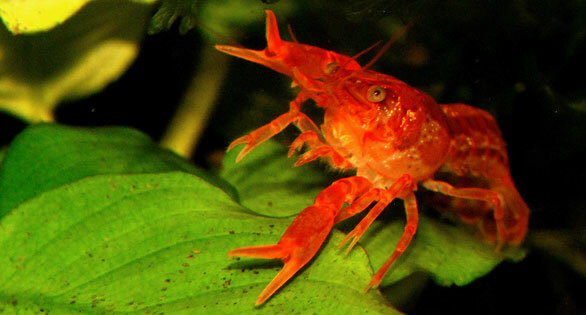 In 2000, we moved into the new house, and half a year later, the aquarium was in operation. I initially planned freshwater stingrays as the primary inhabitants. Then I saw adult Boeseman’s Rainbowfish, Melanotaenia boesemani, in a shop, and I was finally allowed to take a group home after much pleading. Thus began my passion for rainbowfish, and soon I came in contact with the IRG, the International Association of Rainbowfish. Everything began with my living room aquarium. The equipment is hidden in the room behind. Unfortunately, technology on my big planted aquarium failed me. A solenoid valve controlling the automatic water top-off system stuck and pumped cold water into the aquarium all night long. 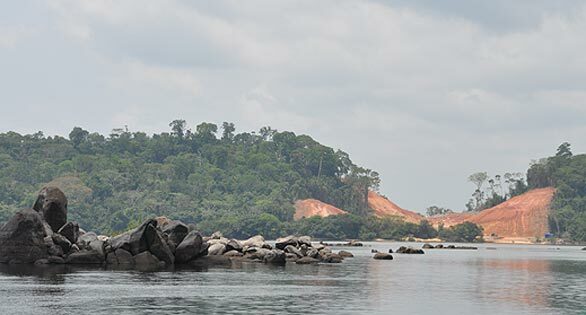 The resulting 9 °C (48 °F) the next morning was survived by only very few fish. We had to restock. Following the large-tank disaster, I decided to expand into multiple small tanks for breeding. …. and one turned into many. First came the move into another basement compartment. Then came one aquarium after another. Finally, the whole room was full, so I started to tweak the system. 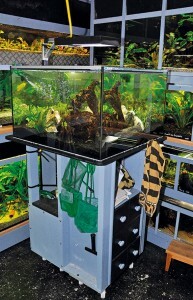 A few smaller aquaria were replaced with larger tanks. A second, then a third, and a partial fourth shelf row were put in. 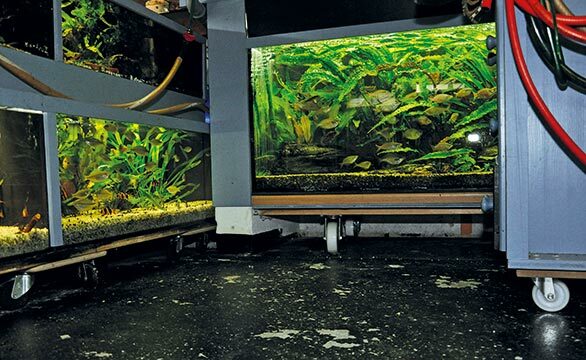 Only the largest aquariums are on a wall constructed with Ytong (aerated concrete blocks, popular for building lightweight tank stands in Europe); the other aquariums are on shelves that rest on large self-welded iron angle brackets, which are fixed with adhesive bolts to the wall. For example, there are two tanks, each with 240 L (60 gal) capacity on three brackets. I am of course my own structural engineer and hope these shelves will hold in the long term. I filter the larger aquariums with external filters because, for my purposes, the “Mattenfilter” foam filters take up too much space. Then I had the next problem: What to do with all the filters? Well, the bottom aquariums received wheels, so I could hide some filters in the corners. To clean the filter, I can now roll the tank to the side when they are half emptied. Mobile stand in center of basement. Click to enlarge. The smaller breeding tanks are all equipped with air-driven foam filters. Overall, I now run a system with a total capacity of about 10,000 L (2,600 gal). 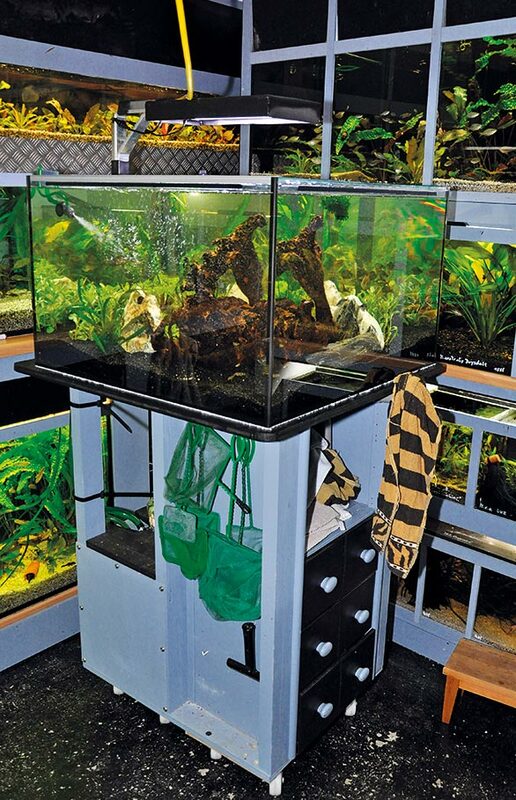 In this system, I keep and breed 60 to 70 different species and forms, the majority are rainbowfishes, with some wild betta species, gobies, Corydoras, and whatever else tickles my interest. However, since the space for the fish is never enough and the walls were filled to capacity, a solution for the center of the room had to be found. A regular aquarium would be in the way, so I needed a movable tank. First, I bought an old office desk, reinforced it with some square timber, and put it on two moving dollies, each with a capacity of 250 kg (550 lb). 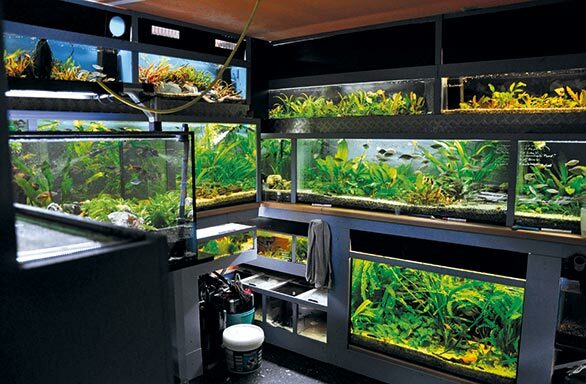 This became the mobile unit for an aquarium with the dimensions 80 x 80 x 50 cm (32 x 32 x 20 in). I love aquariums with more depth. The power for the filter and the lighting comes via a highly flexible 5-pin cable from the ceiling. 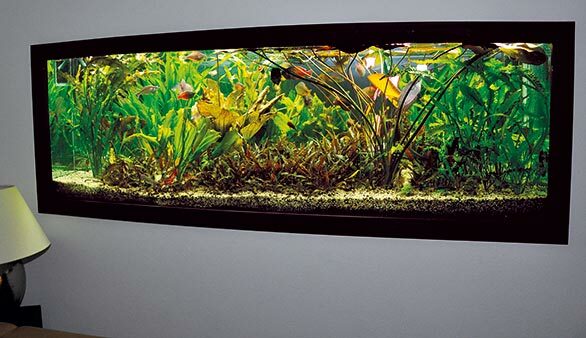 This makes it possible to push the aquarium from one side to the other in order to work unobstructed. The filter moves along. I illuminate and heat the entire system with T5 fluorescent lamps. This aquarium I wanted to illuminate with LEDs. To light only the central part, I chose two strips of “Econlux Solar Stinger Sun Strip” (8 watts each), which I positioned over the center of the aquarium of course mobile too.